It’s not every day that one gets to talk to Wonder Woman, but attendees of GeekGirlCon ‘14 had the chance to do just that! Susan Eisenberg, the voice of Wonder Woman in the animated television shows Justice League and Justice League Unlimited (and more! ), was featured on two panels, letting fans learn firsthand about her experiences. 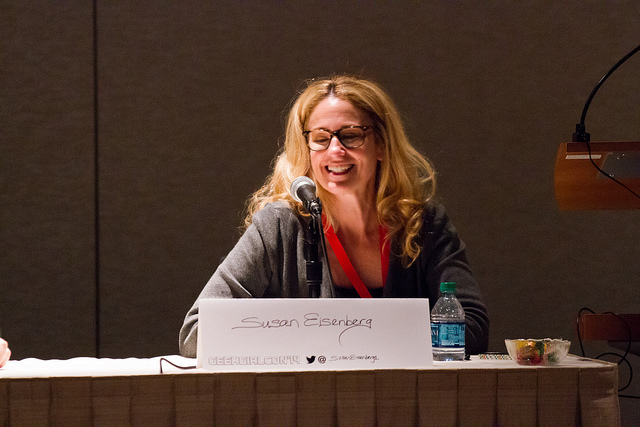 “The Voice of Wonder: Spotlight on Susan Eisenberg” dove into her professional history and voice acting superpowers, with Samantha Cross moderating and The Mary Sue writer Alan Kistler sharing his background as well. while “Great Hera: Let’s Watch Justice League!” was one enormously fun view-along of episodes from the series. The highly animated panels (pun intended!) were a hit, but for those who missed them, we caught up with Susan afterwards for even more tips and tricks of her trade. How did you initially get into voice acting? SE: I actually started out acting, and discovered fairly early on that I was far more comfortable in front of a microphone that I was in front of a camera. I had done radio ads for my father’s business when I was a kid; I did some of the commercials for his department store, growing up in Rhode Island. It scared me to death, and I loved it. You know, it still scares me a little bit, but I still get giddy when I go into a studio! After attending university for acting and voice acting, were you hoping to land a specific type of role, such as voicing a superheroine? SE: When I first started out, anything that came my way, I would say yes to. I would do narration jobs, commercials, regional commercials, and it’s still the same: It’s all good, as far as I’m concerned. You get to do a radio spot, or a commercial for television, or a promo for the NFL network, or you get to be on an animated series—if you love doing voice-overs, then you’re going to love doing all those things. Of course there are distinctions with money; certainly commercial voice-overs are the most lucrative, so you get residuals, but I don’t think there’s anyone out there who does voice-overs who doesn’t covet being on an animated series. I say all the time that getting the Wonder Woman job was the biggest gift of my professional life. I got to have fun all those years on the Justice League and the Justice League Unlimited and now, I still get to play her. How do you think voicing and spending so much time with the character of Wonder Woman has changed your worldview? SE: It has gotten me into comics more, because it’s the universe I’m in. When I first started out, I hardly knew anything. I had grown up reading Archie comics, but I still get a bit glassy-eyed when people start talking about comic book characters’ origins and things like that. I’m lucky enough to have a few friends invested in that universe, so they’ve helped me along. Even if it’s not my passion as much as say cinema is, and soap operas—I love my soap operas! [laughs]—I want to know about it, and what’s happening. Being on Twitter has helped a lot with that, because people talk about it so much. That’s been incredible. I’ve been able to interact with people who are directly connected to her, like Phil Jimenez, who draws Wonder Woman, and Gail Simone and Amanda Deibert. That’s been another great gift. I’ve met them all at cons, and been able to travel the world because of Wonder Woman. I’ve been invited to Australia and New Zealand because of her. That’s just been extraordinary, really special. 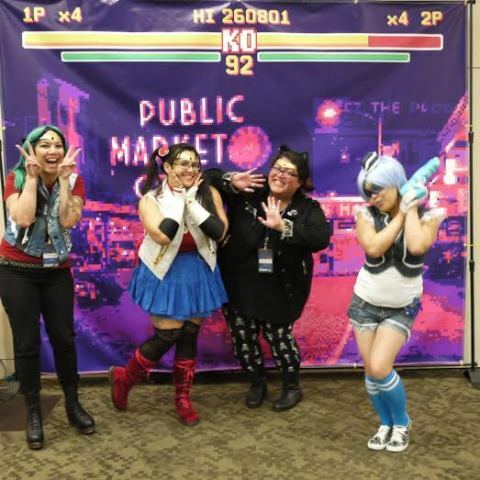 Speaking of cons, what was your experience like at GeekGirlCon ‘14? SE: There were a couple big highlights! One of the panels we did was watching the Justice League episodes, and that was just such a hoot. Watching them with a room full of fans was just unbeatable. I got everyone to sing the theme music. When you’re recording shows, you’re doing it in a small group in a recording studio, or you’re watching it at home. Being in a room full of people who, ten or fifteen years later, are still crazy about the show—it’s so incredibly gratifying. Then, meeting a couple people that I followed on Twitter or who follow me was just so much fun. Meeting the young fans, too, was great. There’s a picture I got of this beautiful little girl, just a tyke, she could barely see over the signing table and she came up in her little Wonder Woman outfit. C’mon, that’s just darling! The best. The best. I also want to mention Samantha Cross, as it was because of her that I went to GeekGirlCon. It was she who invited me and organized the panel with the screening of the episodes, and it was a great idea. I want to give her a shoutout! It was also interesting, because it was so intimate as a con. It’s not chaotic, and I like that. I like the energy around it; there was just a kindness to the people there. It was very sweet. They had science exhibits for girls, and things like that that I really support, so I was very happy to be part of it. Also, while I was there, meeting fans who did grow up with the shows, and who cared about them—I don’t want to sound immodest, but for them, I’m their Wonder Woman, because they’re too young to know Linda Carter. She was my Wonder Woman because I grew up with her, but when I meet people in their twenties and thirties, to know that [Justice League] had an impact on them is really moving. It was such a quality show, and everyone—the actors, the producers, the artists, the musicians, the directors, and especially the writers—made it just so well done. That’s one great thing about Wonder Woman as a character—she’s been in different shows for a few different generations now, yet she’s remained a feminist icon throughout it all. SE: Yes! Except it depends who you ask, because sometimes the word “feminist” gets you into trouble. People get kinda scared, and I’ve never understood why. I think if you’re of a certain age, it’s something to be grateful for, feminism. It’s just equality. Really, to me, it’s freedom and equality, and certainly Wonder Woman is that. You throw truth and justice in there and it’s like, “Hello!” It is Wonder Woman. I feel very, very fortunate. I think about that all the time when people ask about this Wonder Woman or that Wonder Woman, this actress or that actress. The truth is that it’s the character that endures and endures. Whether it’s me or somebody else, an animation or live action, books, comics, whatever, it’s the incarnation. She will just continue to be as popular as she is because, in my opinion, she’s extraordinary. I think in this day and age, we need her ideals and that moral compass. You can’t play somebody like that and not feel it, even in everyday life. I never take that likely. What advice would you give to those who want to break into voice acting? SE: I would say the first thing is to take classes. I think oftentimes, people are under the misconception that if you have a “good” voice, quote unquote, then oh, you should do voiceover. But it’s far more involved than that, just like there’s a skill set for acting. People ask me all the time, “Did you ever want to be an actor?” And I’m like, well, Wonder Woman isn’t me. I wasn’t Diana Prince. I only say “Great Hera!” maybe once or twice a week at most [laughs]. There is a skill set there, and you have to get a demo reel. 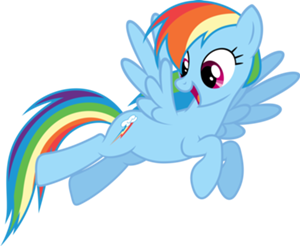 Depending on if you’re doing commercial or promo or animation, you put that together so you can send it out to agents. That way, they can listen right up front and bring you in for auditions. I can’t emphasize the importance of classes enough. I still take classes! There are always things you can tweak and be more comfortable with. You can get into habits, and sometimes it’s just really good to throw it all upside down and get out of your own grooves. Plus, the beauty of voice-over today, as opposed to twenty years ago when I started, is that there were always voice-overs throughout the country, but the big markets—New York, Chicago, Los Angeles—were really the only main games in town. Now, you can have a successful voice-over career living in Minneapolis, living in Portland, Seattle has a huge market, I’m sure. You don’t have to get on a plane and move to Los Angeles; there’s plenty of work to be had. The days that you get to be in front of a microphone: that’s what you’re in it for. Even the days you get to audition; that’s basically our full-time job. You have to audition, and practice, and be lucky. And if you are lucky, just be grateful. Do you have any goals or projects you’re working on now, or looking forward to doing this year? SE: Recently, for DC, I did an online video game, Amazon Fury, and a couple episodes of a show for Marvel [Avengers Assemble]. That’s already done, and there are one or two other things, but I can’t reveal them yet, because they haven’t been announced yet. It’s to be continued! And actually, the other thing I’d like to do more of this year is to be involved with more cons. I can announce that I’ll be going to Emerald City Comicon! I’ll be doing several panels, and that’s a goal of mine. I love being out there. I love meeting the fans and hearing their stories, having them introduce themselves to me and talking about who their favorite character in the Justice League is. If that doesn’t make you giddy—to be in a room with the fans, singing the theme song of the show you’re in—if you can’t be moved by that experience, you’re dead inside [laughs]. 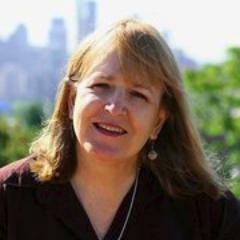 Thanks so much for sharing your experiences, views, and voice, Susan. You do Wonder Woman justice! Join us at GeekGirlCon ‘15 to meet more of your favorite real-life heroes. Purchase your passes today to see all the action! Ask GeekGirlCon: Do You Have Any Geeky Holiday Traditions? No matter the holidays one does or doesn’t celebrate, I think we can all agree: partaking in traditions with loved ones is awesome. And when said traditions include geeky elements, even better. This month, the GeekGirlCon staff was asked to share some of their favorite customs that feature nerdy flair. Adrienne Roehrich, the Manager of Editorial Services and Vice President of the Board, described traditions she’s enjoyed during childhood and as an adult. “The geeky family tradition that I had as a child was playing a game or doing a puzzle on New Year’s Eve. My dad would buy a special 1000 piece puzzle or we’d get a new board game and we’d open it up and play for the first time on New Year’s Eve. We’d head to bed after midnight and spend some time on the puzzles the next day and for a couple weekends until it was finished. 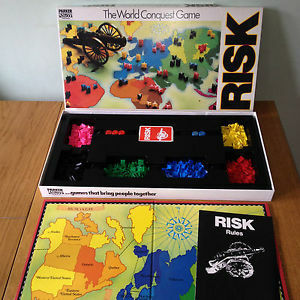 Only one board game lasted longer than one night – the year my sister got Risk for Christmas. That game went on forever. As a Copy Writer for GeekGirlCon, I revel in just about any epic story, and the cold of the winter solstice creates the perfect time to catch a newly released movie. This combo has led to me seeing films such as the Lord of the Rings trilogy in theatres with my friends and family over the past few years. Of course, my favorite holiday remains Halloween, when I can play dress up to express my love of comic books and animated films. 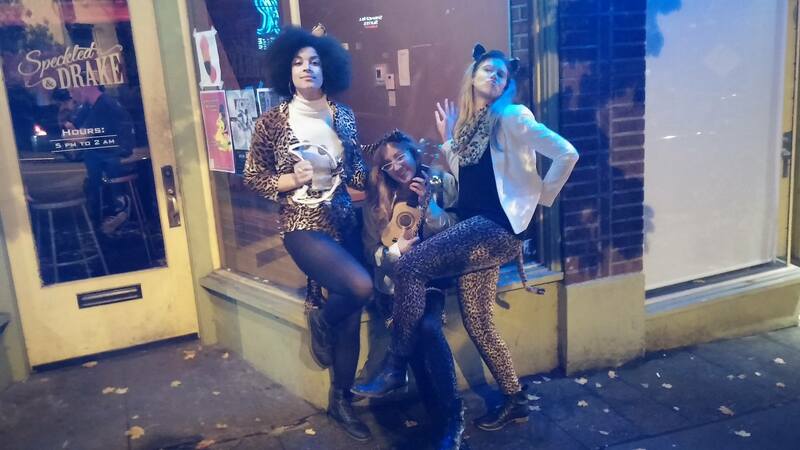 In recent years, I’ve gone as Princess Mononoke, and have been part of group costumes from Alice in Wonderland, The Cat in the Hat, and Josie and the Pussycats. Do you have any geeky holiday traditions? Do you plan to start any this year? I’ve been a fan of the Doubleclicks for some time now, ever since the first time their anthemic Nothing to Prove made me tear up at my desk in grad school. I’m sure it wasn’t just the insecurity and emotional exhaustion of churning out a dissertation in a male-dominated environment that was talking, but hey, there was something in their song that really spoke to me. From songs about burninators to burritos, they could have played the soundtrack to my geeky and socially awkward life. So when the Doubleclicks sent out a call inviting their fans to be part of an upcoming music video, I knew I had to be involved. For their song, Cats at Parties, the Doubleclicks wanted their fans to take a picture of themselves with their pet, holding a word from their song. All I had to do was email them to sign up, be assigned a word, and submit a picture of my pets with the word (so long as the image met certain specifications, such as legibility and size). That sounds easy enough, I thought. 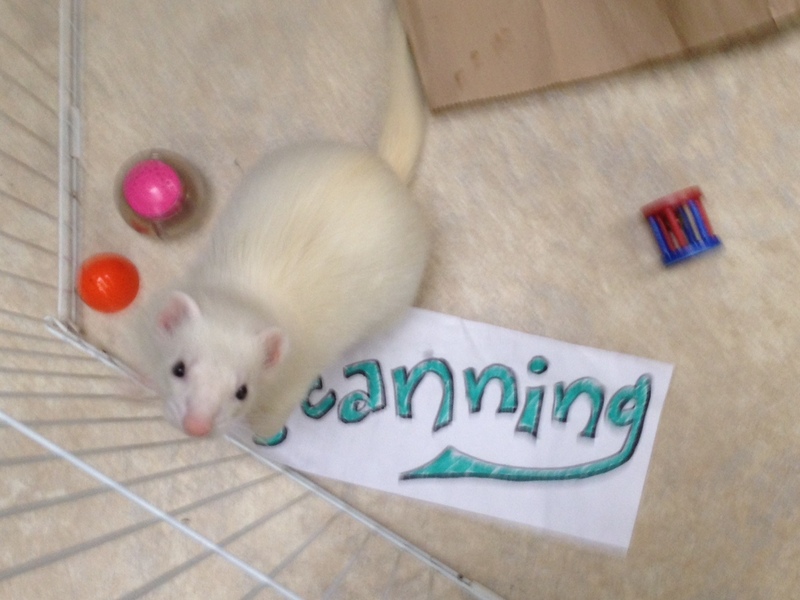 I’m a foster mother for two ferrets, Ben and Jerry, and volunteer at the Washington Ferret Rescue and Shelter, where I spend time taking care of and socializing ferrets that had been surrendered there. I had found out about the video opportunity literally the week after I discovered that my application for fostering had been approved. While they were still waiting to come home, Ben and Jerry were still living at the shelter, but I could visit them when I worked there. What better way to introduce my furbabies to the world than to have them in a music video? I quickly smashed out an excited email to the Doubleclicks expressing my interest in being part of this epic project. “I know ferrets aren’t cats,” I explained, “but they are kind of like cat-snakes, right?” And lo, I received a reply, saying that I had been assigned the word “SCANNING”. I was in! After some attempts at making the word appropriately visible on a sheet of paper—it should have been my first warning that not everything would go as planned when I couldn’t even fit all the letters on a page legibly—I headed in for my shift at the shelter. I had bold dreams of how I wanted to set up the shoot with my ferrets, where they would be obedient and incredibly cute, and how they could frame themselves around the word perfectly. And that’s when I found out that the old adage about never working with children or animals is, for most part, true. 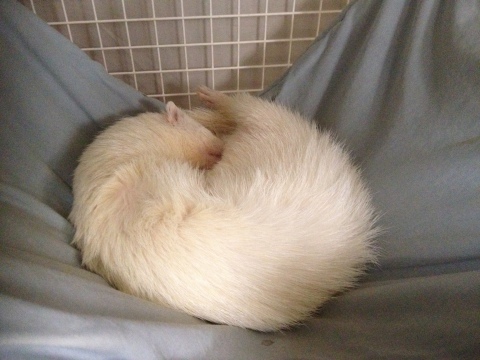 For one thing, ferrets are very excitable creatures, often described as being like a kitten or puppy that never grows up. If you wave a blanket in front of a ferret, it will freak out and bounce around the room. 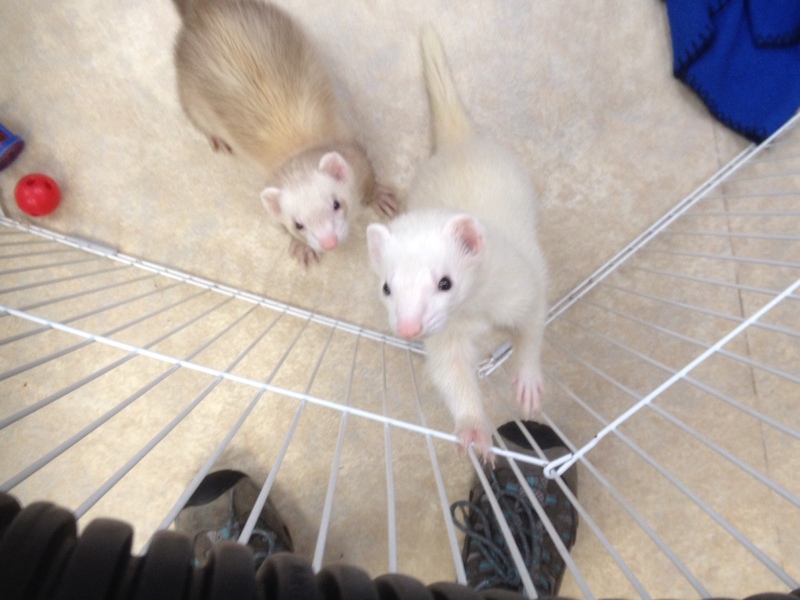 I think the excitability may be more so with ferrets at the shelter; although they have human contact every day, it’s not the same as having them at home. They clamor for scritches, kisses and cuddles when they see their human carers, and it’s really hard to say no. To start with, I tried leaving the word with Ben and Jerry their pen, and photographing their interaction with the word (so that they might look like they were scanning what it was…and that was the extent of my trying to be clever with what I was working with). To a ferret, paper is scrunchy and has a fascinating texture. There was a lot of nosing the sign over and trying to chew the paper. 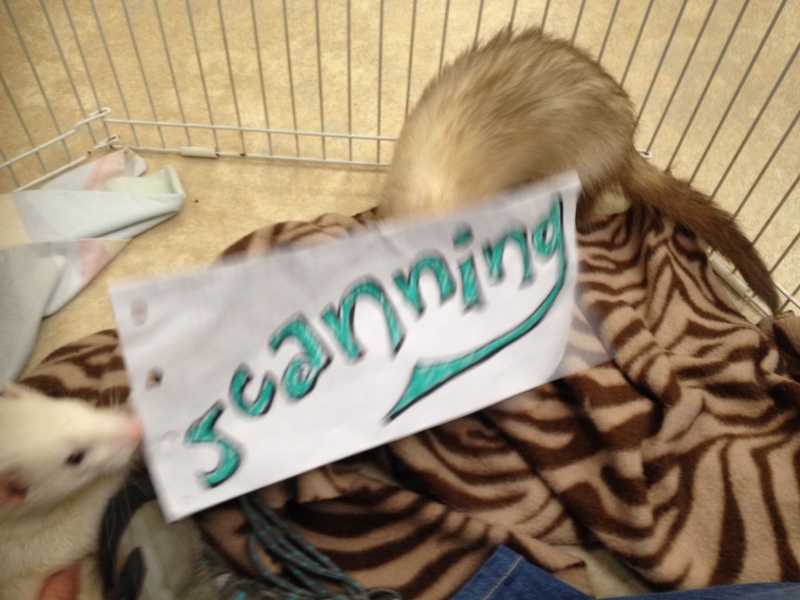 I very quickly lost count of the number of times I had to reset the sign, or rearrange the ferrets, or wave maniacally to get their attention. Ferrets also have sensitive footpads, so standing on the paper was a particularly fascinating experience for them. Of course, in order to have all their feet on the paper, they had to stand over the word, so that it was obscured. Why, oh why couldn’t the Doubleclicks have written a song about “canning”? Initially, my plan was to have Ben and Jerry pose in the picture themselves, but asking a ferret to sit still is like asking a small child to do advanced calculus whilst performing acrobatics. I’m sure it’s possible, but it’s incredibly unlikely. Getting their attention for a split second was barely enough time to take the picture. 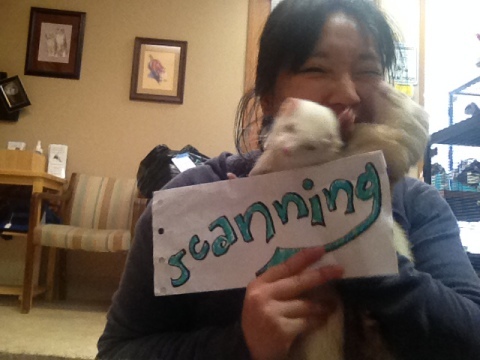 Further, working with two ferrets made it doubly hard: even if I could get one to look at the camera, the other would run out of shot. With a combination of envy and pity, all I could think of at this time was that there were people that made pet photography a profession and dealt with this madness on a daily basis. Either they had some animal-whispering superpower that I clearly lacked, or they had the patience of saints. Or both. About halfway through our ordeal, I got a brilliant idea. Maybe I could hold both of them with one hand, and the word with the other, and set the camera on a timer! I don’t know what sort of demented desperation led me to that belief, but at that point I was willing to give anything a try. The Doubleclicks were counting on me, and I didn’t want to let them down! I gathered up Ben and Jerry, thinking that if I was holding them, they would think that they were being cuddled enough to calm down for the three seconds it would take for the timer to go off. I suppose they were several steps ahead of me, because they managed to lull me into a false sense of security around the two-second mark, before squirming out of my grasp. At one point Ben clawed onto my head in a failed escape attempt, and that’s to say nothing of the other violence I experienced at their paws. I was punched, scratched, licked and bitten in my quest to get the perfect picture. When it became clear that the “perfect” picture was a quickly-fading ideal, I was further punched, scratched and bitten in my attempt to get a remotely passable picture. At the end of the day, I went through my photographs and found out that, of the 400 I had taken, only about 70 came out remotely non-blurry. I sifted through those and took out another 40 where the word was obscured. From the remaining 30, I took out ones where a ferret was out of shot, and then looked at what was left. Four photos. FOUR. 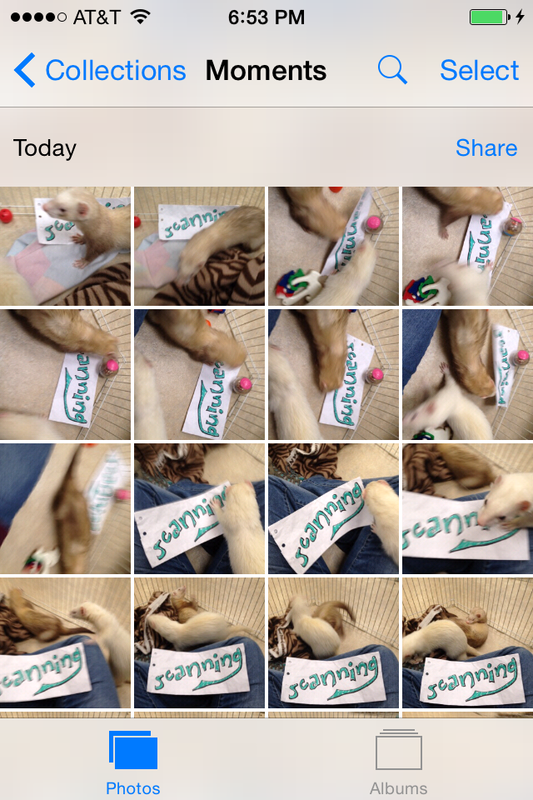 I had put my ferrets through an afternoon of awkwardness with a 1% success rate. It was disappointing, but I didn’t feel right putting them through more photography. I picked one of the photos and sadly emailed it in. I wanted to submit the perfect picture with Ben and Jerry posing like adorable little cherubs, but instead I sent in a picture where my cat snakes were trying to escape my death grip. And they weren’t even looking at the camera. Jerks. Despite its imperfections, the picture was accepted! I’d seen some of the other submissions, and I was really impressed that other people had gone to extensive amounts of efforts, with hats, drinks, bunting and party blowers—not that I had any hope of achieving anything like that with Ben and Jerry. And when the video was released, my worries were allayed. We were in the video, and it was truly exciting to see how our word would fit in. In retrospect, I can’t believe I did that much work to be in a music video for a few seconds (although, to be fair, it had multiple syllables in it and was at the beginning of a line). But hey, this really was a labor of love. I’m sure that my story is not unique among the 300+ participants in Cats at Parties. I’m sure that other people also took an inappropriate number of photographs in their attempt to get an acceptable picture to submit. I’m sure that other pet owners were subject to abuse by their pets in the process. Even so, seeing us make it into the video made me feel like a proud parent whose kids are onstage in a school recital, even if they didn’t have a starring role. It was a wonderful feeling knowing that we had participated. For their efforts, Ben and Jerry got extra kibble and cuddles. I also tried to show them the video, but I think they’re done with the music industry. 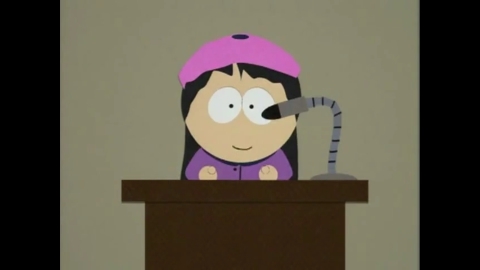 When most people think of South Park, I doubt that feminism comes to mind. For years, the satirical show has been best known for its crude humor and irreverent catchphrases. 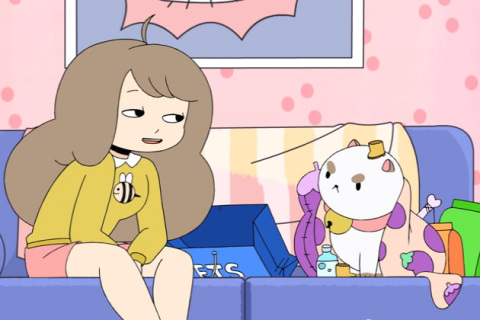 To me, though, one of the most impressive elements of its ongoing eighteen-year run is the development of Wendy Testaburger’s character. Class president, speech writer, outspoken feminist: Wendy Testaburger, everyone. 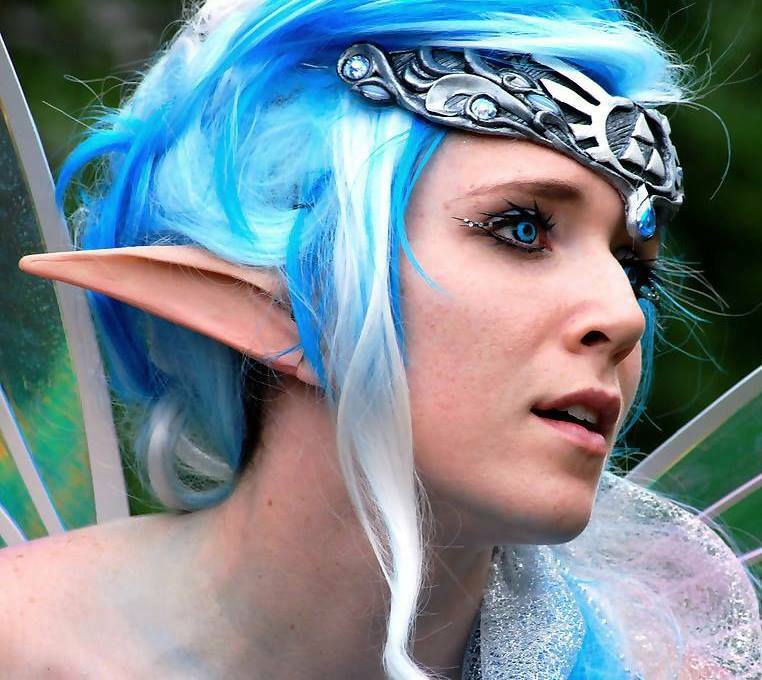 Ask GeekGirlCon: Do You Plan to Cosplay at GeekGirlCon ’14? Has it sunk in that GeekGirlCon ‘14 is just five days away?! That fact still doesn’t feel quite real to me, but I’m glad that it is! While there will be thousands of awesome things to do there, one of my personal favorites parts of the Con is seeing all the crazy-creative cosplay. Many GeekGirlCon staff members get in on the fun too, and we wanted to give you a sneak peek into some of our ideas so you can spot us over the course of the weekend. 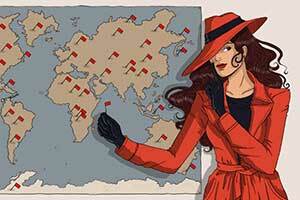 As a huge fan of strong female characters, this year I’ve decided to cosplay as Carmen Sandiego. I also enjoy travel, being sneaky, and making tons of puns, so I think she’s perfect. Please feel free to come up and say hi at GeekGirlCon ’14 — if you can spy me running around! If you haven’t yet, purchase your passes now, and get ready for an unforgettable weekend! 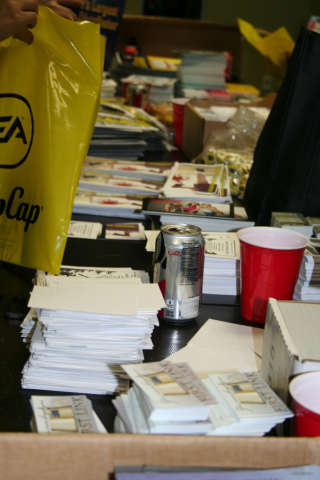 Satisfy Your Craving For Comics at GeekGirlCon ’14! From veteran graphic novel lovers to comic book beginners, there’ll be something for every reader at GeekGirlCon ‘14! Offering jokes, action-packed panels, and instant graphic-ation (get it?? ), comics make fantastic gifts and collector items. 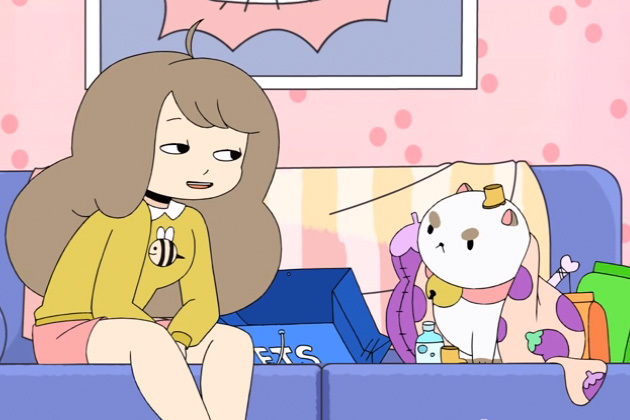 Several brilliant web comic creators will make an appearance, so you can get your hands on content that’s usually only online. Here’s a tiny, tasty sampling of the readable goodies you’ll find in the Exhibitors Hall. Artist Aaron Diaz will be coming up from Portland to display Dresden Codak, his impressive series of web comics. The futuristic storylines include female protagonist Kimiko “Kim” Ross, tongue-in-cheek humor, emotional truths, and a dash of steampunk-esque costumes. Fans of robots and complex mysteries will love the intertwining plots and imaginative characters—such as a TV-headed cat! The creative team behind Weregeek will be joining the fun as well. Canadian trio Alina Pete, Layne Myhre, and Todd Myhre craft tales of die-hard D&D-players, vampire fans, and of course, Weregeeks—people who “get a handful of dice and an unholy hunger for Cheetoes” whenever a full moon rises. Sound like you? Swing by their booth to check out these clever, nerdtastic comics. You can also use your fan-powers for good by supporting independent publishers at GeekGirlCon ‘14. One such example is Corvid Comics, a family-run press that issues comic books for both adults and children. Whether you dig black and white comics, full-color kids’ books, or both, you’re sure to walk away with a stack of future favorites to read—especially since their prices are ridiculously reasonable. The inimitable Northwest Press team will be present to capture hearts and minds again this year. In their own words, the minds behind the company are “dedicated to publishing the best lesbian, gay, bisexual and transgender comics collections and graphic novels”. This ultra-important mission has supported the LGBT community in a variety of ways, including by bringing realistic, underrepresented characters and their stories into the public eye. This press is truly doing fantastic things for the world—stop by their table to see them in action and meet your next favorite character. On top of all this awesomeness, many exhibitors from GeekGirlCon ‘13 are coming back again! Meet or reconnect with the makers of Little Vampires, Skin Deep, Soulless, Larsen Geekery, and many more. Support independent artists and keep up on beloved storylines by picking up all the latest issues you may have missed over the past year. This mini-list is but a glimpse into the countless comics that will be present at GeekGirlCon ‘14 for rookies and longtime readers alike. Be sure to check out the many panels (pun intended) pertaining to comic books as well. Buy your passes today and pore over all the geeky goodness with us! Thousands of eyes looking at your logo. That’s how much attention your brand will catch by appearing in this year’s swag bags! From now until September 26, GeekGirlCon is accepting submissions of promotional items from geeky businesses and organizations. Each GeekGirlCon ‘14 attendee scores one of these satchels, and we are expecting more event-goers than ever this year! Countless costumed heroines and fun-loving fans could all be flashing your brand every time they reach for a water bottle, pick up a bookmark, or throw on some sunglasses. Whatever you prefer to donate, you’ll be giving support to a cool cause—not to mention geeks at large. 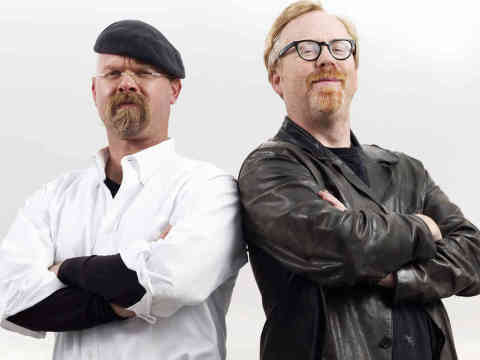 And you know geeks always remember the good people who’ve got their backs. Simply fill out our handy-dandy webform to get started and snag a spot for your stuff. Should questions or concerns arise, please email swagbags@geekgirlcon.com. We look forward to working with you to fill swag bags for the estimated 4,000 people attending GeekGirlCon ’14! In the famous movie The Last Unicorn, the protagonist goes on a quest to discover whether or not there are other unicorns in the world. Though a multitude of her fellow magical creatures do exist, she is made to believe she is the only one left, causing her great loneliness and concern. Much like the unicorn in the film, it can often feel difficult for female geeks to find and meet others like them. There are countless strong, self-identified geek girls and women, as well as communities that support them, but naysayers can make it seem otherwise sometimes. To combat the myth that female geeks don’t exist, writer Terra Clarke Olsen created The Unicorn Files. Through this project, she and photographer Nate Watters speak with and take pictures of geek girls and women. Each interview and image allows participants to represent themselves and their geekdoms exactly how they’d like — through their own words, with pictures of their various collections, clothing, dwellings, and anything else that makes them feel empowered in their geekiness. We chatted with Terra to get the inside scoop on The Unicorn Files, so even more people will be aware of it (and can get involved!) and the fact that yes, females geeks do exist! GeekGirlCon: What are you favorite geeky fandoms, and how do you participate in or express your passion for them? Do you remember where you were or what you were doing when the first inkling for this project sparked? There wasn’t so much of a spark as much as kindling that slowly grew. Over a year ago, when the whole “fake girl” debacle was getting really heated, I was reading a lot of women’s opinions on the subject matter. All great pieces, but words can only do so much. I thought it would be great to have a way to show, in a very personal way, how women are very much a strong and important aspect to the geek community. I kept throwing this idea out there (usually in frustration, after reading another instance of male geeks denying lady geeks exist), when my husband finally was like, “you just need to make this project happen!” So I contacted my good friend and talented photographer, Nate Watters, to see if he would be interested in creating this project with me. He was into it, so here we are! The Unicorn Files aims to show that female geeks exist, one geek at a time. We strive to capture the diverse body of female geeks by featuring individual geeky women, giving women in the community a chance to tell their story. Who was your very first interview/photography session with, and what did you learn from that experience? Our first model was my dear friend Meg Humphrey. I’d mentioned the idea to her and she loved it, so of course I jumped at the opportunity to photograph her and share her story (which is a beautiful one, I might add). Honestly we had it easy with Meg since our rapport is so great, and she has such a wonderful and bubbly personality. What I did learn was that even the most outgoing people can be shy in front of the camera. Meg definitely had her shy moments, but as she became more comfortable with a camera in her face and me fiddling with her clothes, she loosened up and let her personality shine through. I’ve learned that my job/challenge to is ensure that each woman is comfortable with us and the process to ensure that we capture the real them. If we do that, then I feel like we have done them and the project justice. Yes! A lot of women are shy in front of the camera (some women have refused to volunteer that I’ve reached out to because they don’t want their photo taken, while others have written in saying that they hate having their photo taken but they love the project so they want to make that jump). That is one reason we photograph women in their homes, we want to ensure that they are in an environment that is comfortable and safe – I think this helps a lot. In addition, we spend extra time letting women loosen up to get use to having a giant camera in their face….that and I often jump around and make faces like an idiot, hahaha. I can’t help making faces though, I’m very animated by nature. We also show them pictures as we go so they can see how wonderful they look! I think once they see that they look beautiful and that we’re really there to capture them, they become more comfortable. Yes! Time and money. We got a lot of volunteers who wanted to be photographed who are not in the Northwest. At first I thought it might be possible to take a few trips to capture these women, but as time went on, it became more apparent that this wasn’t going to be possible (not yet, at least). Nate is a full time photographer with a busy schedule, and I have a full-time job (in addition to volunteer and freelance work), so we really have to be creative when scheduling these shoots. In addition, it has been hard to find a diverse body of geeky women to volunteer to be photographed—this has been more challenging than I would have imagined, to be honest. Because the northwest is fairly white, many of the volunteers have been white women. Obviously their voices and opinions matter, but it wouldn’t do the project or the community justice to just give these women a voice. So I have been trying to reach out to more people to see if they know anyone who is not white in the area that would be interested in volunteering to be photographed. Another challenge has been finding older women to volunteer. Again, I want to make sure the project stays true to its mission, and I can’t achieve this by only showing 20 year olds (not that 20 year olds don’t matter!). At the same time, I want people to volunteer organically whenever possible. I love getting emails from women I don’t know or have any connection with saying they want to volunteer — that is the best! Hopefully with more exposure and more people learning about the project, more women will feel comfortable volunteering. What kind of feedback have you received from viewers of the project? How about from those who have modeled and been interviewed for the project? So far, the photographs we’ve taken have not been available to the public. We liked the images so much that we’ve decided to launch a Kickstarter later this year so we can self publish the collection into a book (look for it mid-September!). However, we’ve received really great responses regarding our tumblr, where we post images that women send in to us, along with their bio (which I create from a questionnaire I have them fill out) and a quote. I’ve heard from models and the women who have submitted their photos online that they are excited about the project and love learning about other geeky women. Has your vision for this project changed at all since you started it? My vision remains the same — give other women in the community a voice. But now, I am more determined to find a way to continue the project so we can photograph people all over the US and world! I realize that this may be a bit ambitious, but I don’t think the true mission of The Unicorn Files will be completely fulfilled until women from all over have a chance to be photographed in a meaningful way. What do you hope people will take away from The Unicorn Files overall — both its readers and its models? When reading The Unicorn Files, I hope that people realize that geeky women are NOT unicorns. We exist and are a big part of the community (and care deeply about it, I might add). Our voices matter. Thanks so much for chatting with us here at GeekGirlCon, Terra, and for the fantastic work you’re doing for female geeks everywhere! Want to learn more? 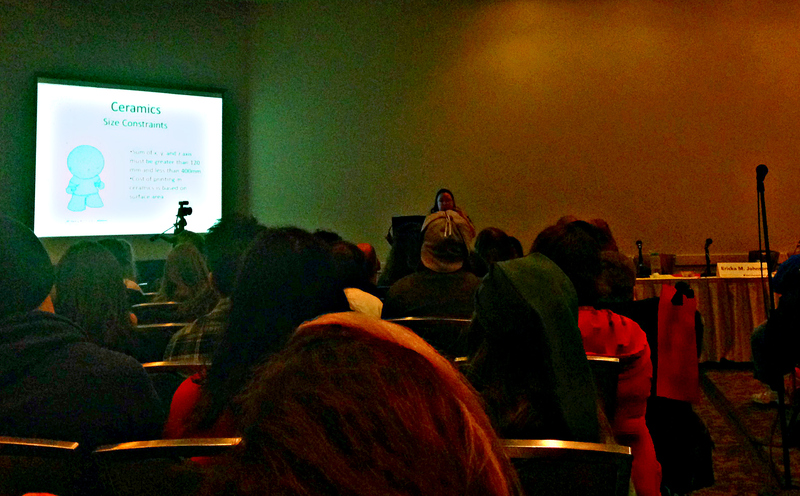 Terra is appearing on a panel about the project at GeekGirlCon ‘14! Purchase your passes today to get in on the fun! 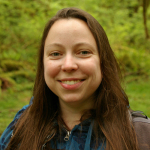 A long-time geek and feminist, Terra works for a mobile indiegaming company and writes for Seattle Weekly. She is the founder of Have You Nerd, a lady geek blog, and The Unicorn Files, a feminist project that highlights fellow geeky ladies. 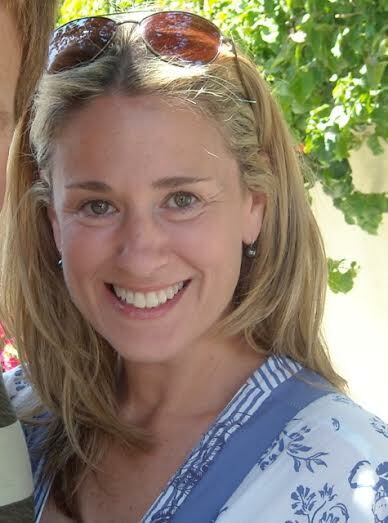 She loves helping people share their stories and giving others a voice. She has a BA from UCLA, and a MA in Medieval Studies from University of Toronto. 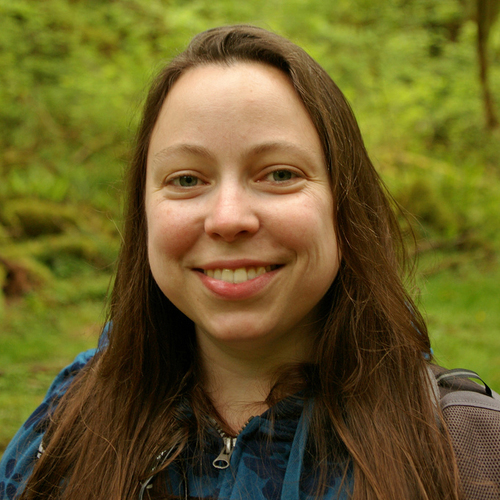 Terra lives in Seattle with her husband, Randall, and two cats, Han and Chewie. Find her @terrasum.